Piano guts! The lid desperately needs varnishing, but the insides are beautiful. Here you can see the Oberdämpfer, top-dampener piano mechanic, also called Birdcage Action in English because the wires from the dampeners are caging the hammers in the mid and lower octaves. 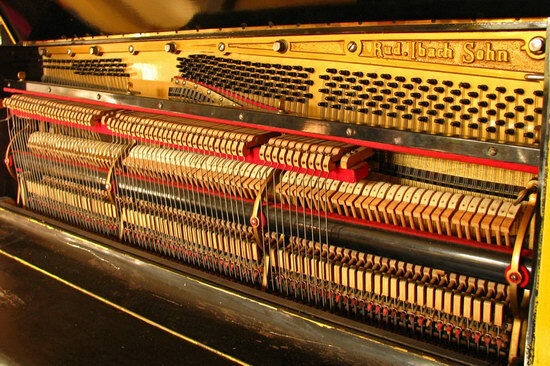 As far as we know, this is the original mechanic from this piano, only the hammers and some felt parts were replaced about 25 years ago and considering it’s over 100 years old, the refurbishment is practically brand-new.